Our last day of camp has been a wonderful day! We started off with the shorter sports sessions again this morning. After lunch we had free time where most of the campers decided to swim in the lake. The campers were all having such a great time in the lake that we decided to skip English and crafts today and give them more time to swim. Swimming in the lake quickly led to a homemade slip n slide which was also great fun. We took a group picture of all the campers, counselors, and our team before dinner. Everyone wore their tie dye t-shirts they made yesterday during craft time. The photographer had us all looking straight into the sun when he took the picture, so it’s doubtful that anyone’s eyes will be open! For dinner tonight we decided to give the campers a treat and our team ordered pizza for everyone. We had quite a surprise when the pizzas were bigger than any pizza we had ever seen in our lives. 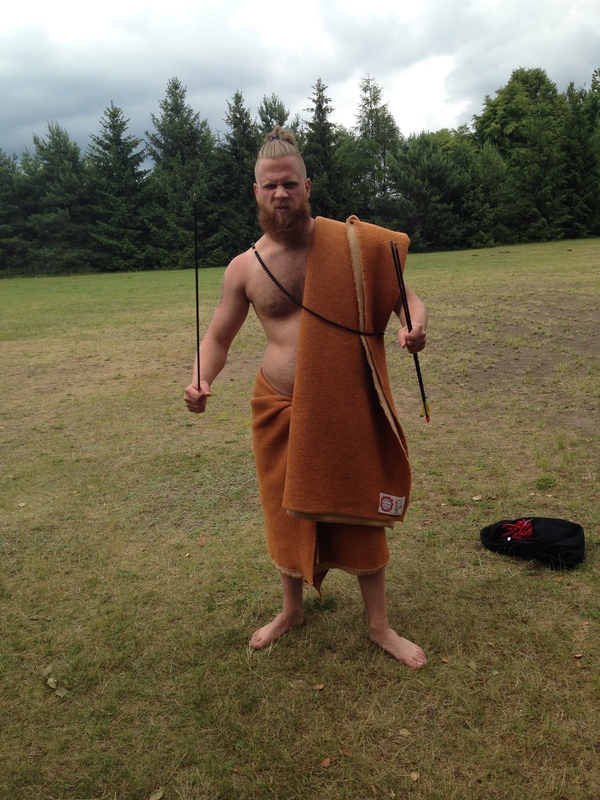 We were also misguided into ordering 21 pizzas when 9 or 10 would have fed the entire camp. So it looks like we’ll be having pizza for breakfast! We’ll have our last worship service tonight and then tomorrow morning the camp will wrap up and the campers will head home. This will most likely be the last blog post for this year so, thank you all for reading and keeping us in your prayers! 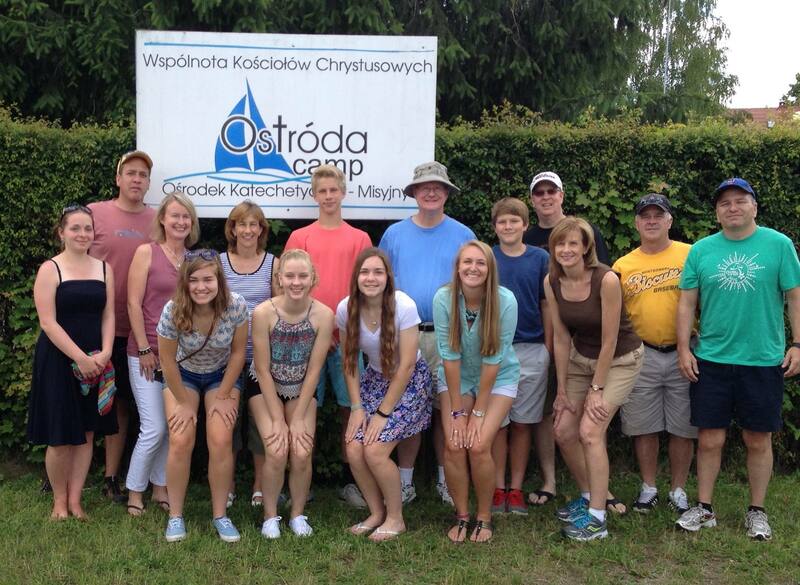 It’s been a great year at Ostroda camp! The theme for camp today was God wants you to be Free!! and the scripture to go along with this was Luke 4:18. Tonight was the most important night spiritually of camp. We were lucky enough to have a fun Polish Christian band come and lead our worship service. Everyone was really feeling God’s presence during the worship songs. There was lots of clapping, dancing, and jumping all night. One of the members of the band is a hip hop artist and performed several rap songs. Lots of the boy campers really enjoyed those songs. After the music, we had a very powerful message given by our worship leader, Sergiusz. He talked about how even though we may have literal freedom, that doesn’t mean we are free with God. We need to be free from everything holding us back from our relationship and walk with Christ. After his message he invited anyone who wasn’t feeling the freedom of God to come up and pray to receive that freedom. Almost all of the campers came up and we had a time of prayer and thanksgiving. It was such an amazing experience to see so many young people give their lives to God. The worship service was definitely the highlight of camp today, but we also had a great time during the sports sessions. We stuck with the shorter sessions again this morning since it was the hottest day we’ve had yet. After sports we started our annual soccer tournament led by Jeff Rush. All of the participants played really hard and the spectators had a great time watching and cheering. Tomorrow the teams will compete in the semi finals and I will report back with a winning team. We ended the night with a secret McDonalds run for the counselors and Americans and we are all happy campers with our milkshakes and cheeseburgers. Tomorrow will be the last day of camp and we’re all shocked at how quickly the week went by. It’s been another great year at Ostroda Camp and we’re so thankful for all the prayers and support our Pender Family has provided! We send lots of love back home from Poland! Our day started out a little dicey due to everyone except the Americans being told that breakfast was moved to 8:30 rather than 8:00 this morning. 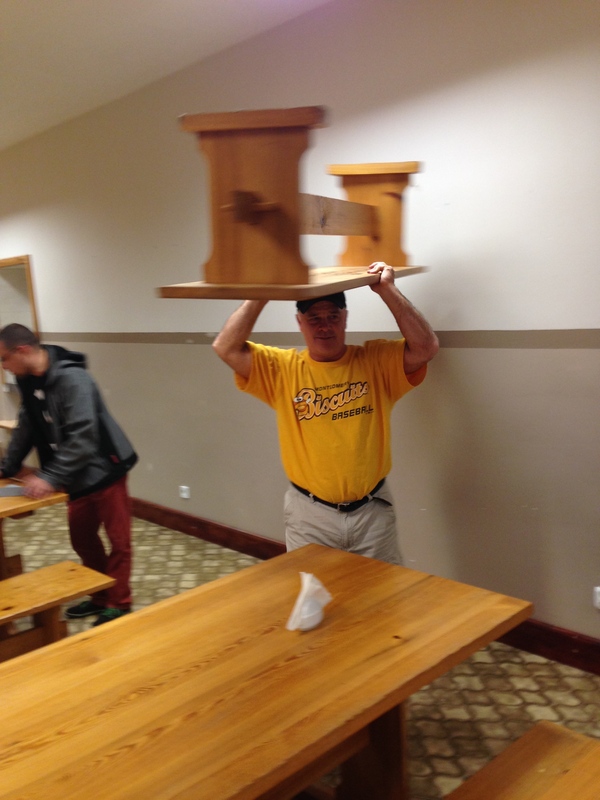 The team walked into the dining room and was quite confused when no one else showed up. The situation was quickly remedied by everyone bringing bowls of cereal to our meeting area upstairs and having our morning devotion before breakfast instead of after as we do most mornings. While on the topic of food, I think I should share that we had bright pink beet soup for lunch and it was absolutely delicious. The camp theme for today is “Who is God?” and the scripture to go along with it is Psalm 34:8 and Psalm 100:5. Our devotion today was given by Jeff Rush and he did a great job of helping us start our day focused on God and our purpose for being here at camp. Sports session resumed as usual today and we had two sessions, both about 2 hours long. The campers were able to choose which two sports they wanted to participate in today. The baseball crew had to live up to Mr. Shuping’s favorite quote today which is “we’re nothing if we’re not flexible.” They arrived at the baseball field near the campsite today and opened their eyes from the opening prayer to see an older, shirtless Polish man standing there staring at them. He greeted them with “what’s up?” and proceeded to inform them that the field was being cultivated and could not be used today. They came back to the campsite and attempted to play wiffle ball on the field at the campsite and “what’s up” quickly became our joke of the day. Tennis had a big group today and they did a lot of work on their different strokes. Everyone looked like they were having a great time! Basketball focused on passing today and played actual 5 on 5 games for the first time. There was a small controversy over International vs. United States rules on when a person/ball is considered out of bounds, but ref Chrissy took control of the situation. Before our evening worship service tonight everyone participated in line dancing to songs like cotton eyed joe and YMCA. It got a little silly! At the moment everyone is outside playing soccer and volleyball or downstairs playing ping pong. Somehow we all have some extra energy to burn off before lights out! The theme for today was “The Problem with Separation” and focused on the verses Genesis 3:23-24. Our morning devotion was given by Charlie and discussed not only the verses of the day, but also the need to share our hope with others. Since it was raining last night and most of the morning we switched up our daily schedule and had the English workshop and crafts this morning. In English we played a game called “would you rather.” In this game Mrs. Shuping would read two statements such as “would you rather go to the doctor or go to the dentist” and the campers had to pick a side to stand on to go along with the statement they agreed with. During crafts the campers made bracelets with beads and surprisingly the boys lasted longer in the craft room than the girls. After lunch when it had stopped raining we walked to the school near the campsite and used the gym and field there for our sports sessions. We were only able to play basketball and baseball given the weather conditions. In basketball we worked on shooting and played a lot of knock out, which the campers always love. The campers had a lot of fun in baseball and are really improving on their hitting and catching. After sports were over the campers and American youth had a chance to go kayaking in the lake. It was an afternoon filled with lots of splashing and laughing. A good time was had by all. Shortly after our much needed break and delicious dinner we had our evening worship service. We were fortunate enough to have two skits performed during the service. The first was performed by Philip Helms and several Polish youth and depicted the story of the Garden of Eden. The second was performed by Hannah Cacner and Iva Shuping and focused on sin and how God is saddened by our sin no matter how big or small the sin may be. Now we are having quiet time before we all head to bed so we will be well rested for another busy day of sports and activities. Our theme for Day 2 of camp was “Who are you?” and Tanja started our morning off with a great devotion focusing on John 1:12. She asked us to think about how we are all a unique and special piece of the puzzle that makes up the Body of Christ. This devotion tied in with our craft for the day which was for everyone to decorate a giant puzzle piece. Later tonight we will put all of the pieces together to form a giant puzzle with all of the unique and special designs by the campers. Mike Dingman led football. Mike covered throwing, catching and kicking the ball. They also played games and ran a few plays. Dave Cacner, Gabrielle Bryda, Hannah Cacner, Iva Shuping and Chris Helms assisted with both football and baseball. Laurie Cacner led tennis with an introduction to the game, forehand and backhand drills. Tanja Helms, Laura Shuping, Hannah Cacner assisted. Many of the campers played tennis last year and mastered these stokes very quickly. Jeff Rush led basketball with Chrissy Wetzler and Phillip Helms assisting. He started with many games to learn how to dribble correctly, such as packman, knockout and freeze tag. 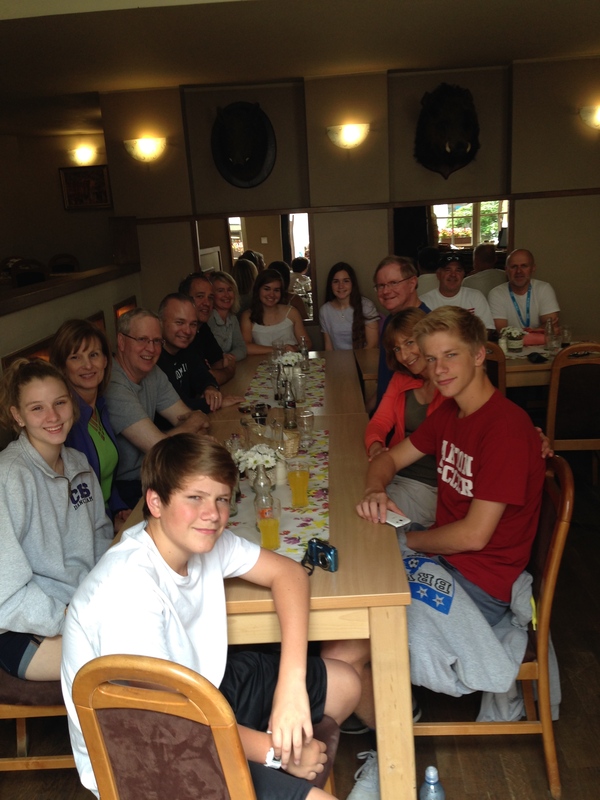 English was led by Laura Shuping and was assisted by many team members and Polish counselors. 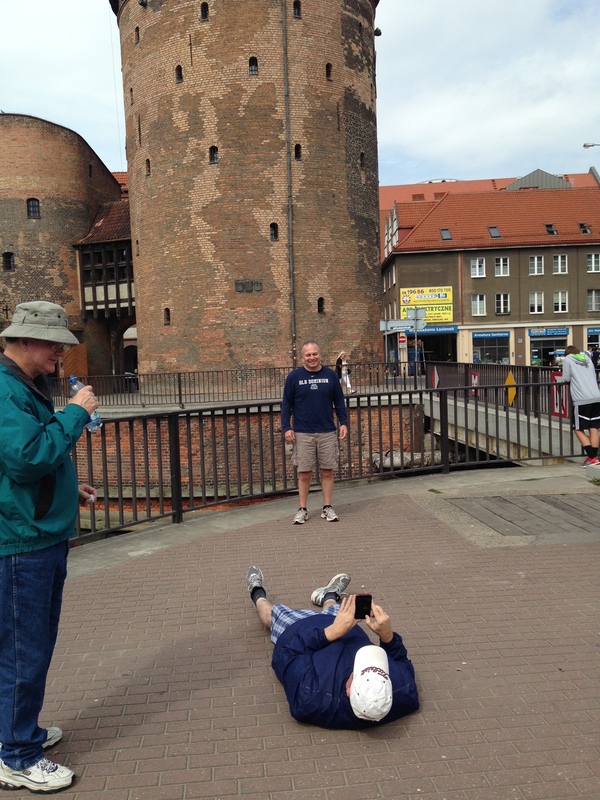 They started with reading the days scripture (John 1:12) in English and then in Polish. 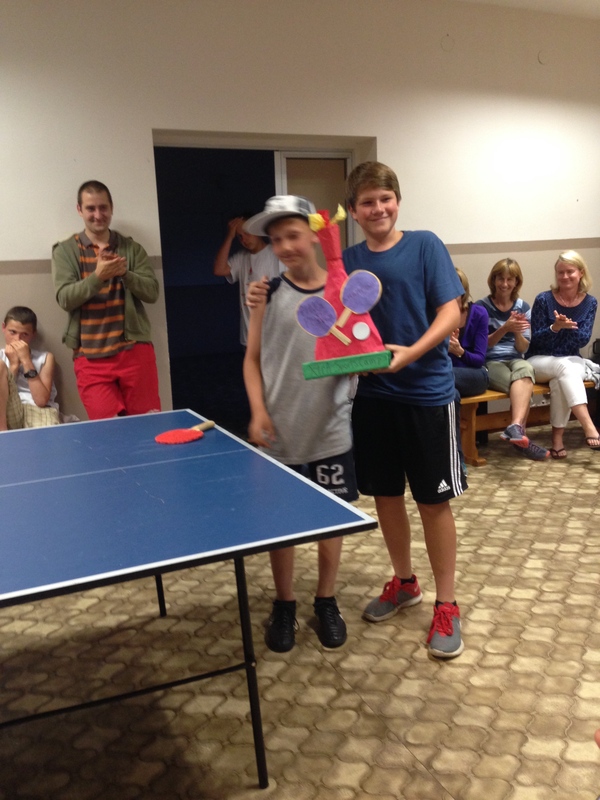 A Polish camper read it in English and Gabrielle Bryda read it in Polish with assistance from the campers. The Polish youth love hearing the American’s try to read Polish. It is not easy. Then the campers played a skittles ice breaker game to learn everyone’s names and something about who they were. Then everyone played a game called head bandz. Crafts was led by Tanya Helms with assistance from many team members. The campers decorated pencil pouches and the puzzle pieces turned out awesome! The puzzle was put together and will be hung in the cafeteria for everyone to enjoy. We started our morning with a devotion led by our team leader, Mike Dingman. He shared that we should be practicing boldness throughout the camp this week – specifically in being bold while talking to the campers about our faith. The scriptures we focused on were Psalm 138:3, Proverbs 28:1, and Acts 4:29. So join us in being as bold as lions in sharing your faith this week! 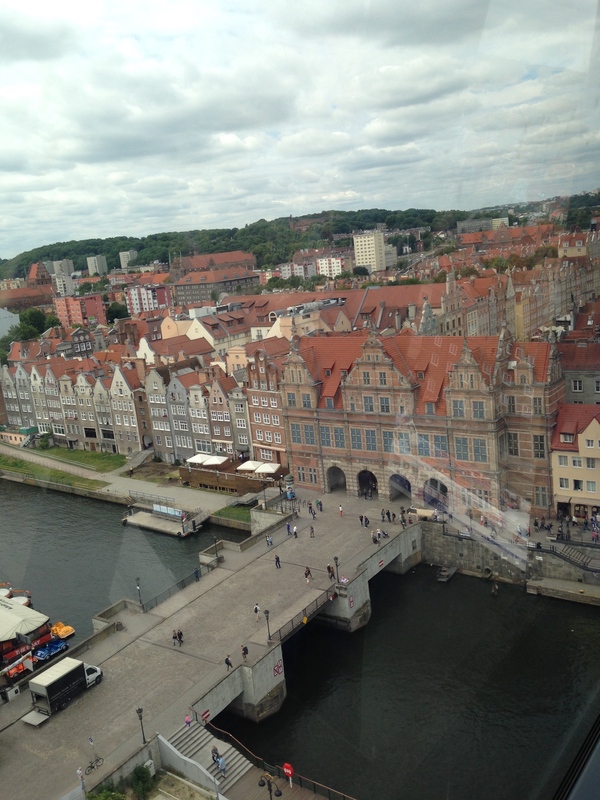 Our visit to Gdansk gave us a relaxing day filled with lots of sight seeing and shopping. 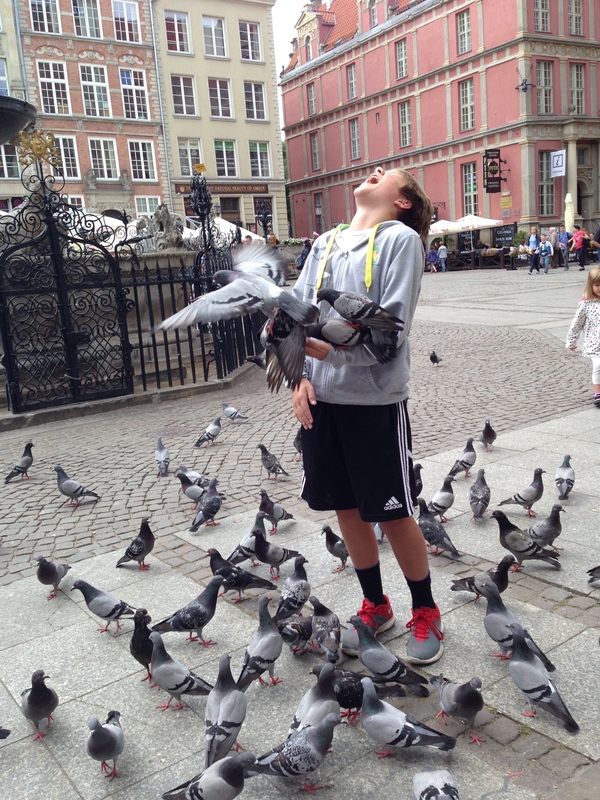 One of the highlights included watching a little Polish girl feeding the pigeons bird seed, and then our own Philip feeling the need to join in. He was quickly attacked by the herd of wild pigeons.We finished our visit with a team lunch of delicious pierogis – a Polish tradition! By the time we arrived back to the campsite, lots of campers had already arrived! We had an opening get together led by one of the Polish worship leaders, Sergis. His main message to the campers was that everyone has a place in this camp and everyone is here for a reason. After his message we gave demonstrations of the four sports we’ll be teaching – basketball, tennis, baseball and football. Later in the evening we played a few ice breaker games to get the campers loosened up and feeling more comfortable. One of the games we played required the campers (and American youth) to break up into 4 relay lines, one at a time they would run to the other side of the field, put their head on a baseball bat that was also touching the ground, spin around five times, and then run back to their team. The games definitely broke the ice for everyone! Now we’re all having some quiet time and resting for the start of the sports sessions tomorrow!